Joseph Hoag (1762-1846) son of Elijah Hoag and Phebe Hoag. He married Huldah Case (1762-1850) daughter of Nathan Case and Elizabeth Mussey. The couple had 10 children. 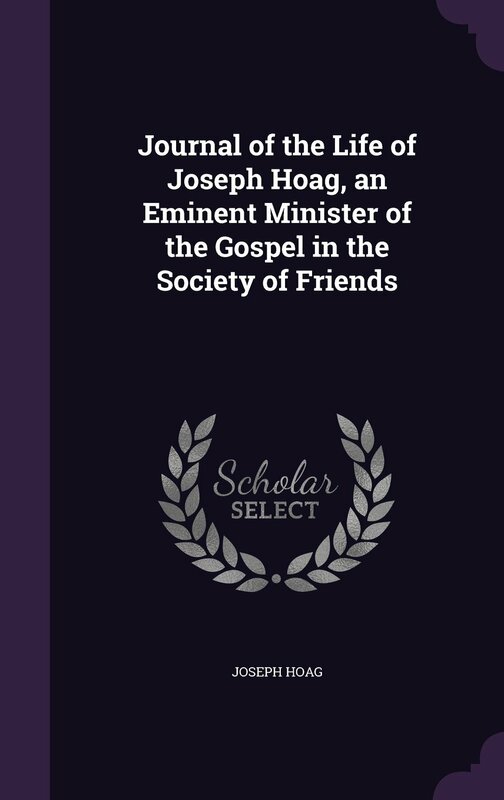 Joseph and Huldah were both Quaker ministers. 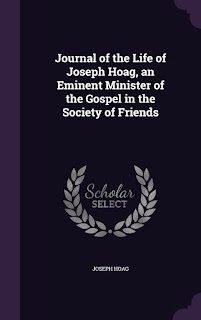 Joseph was working in the fields and had "Vision" in 1803, which purportedly prophesied much future history, including the Civil War, was widely circulated in manuscript among Quakers in the 1850s. Includes references to Frederick Douglass. In the year 1803, in the eighth or ninth month, I was one day alone in the field, and observed that the sun shone clear, but a mist eclipsed its brightness. As I reflected upon the singularity of the event, my mind was struck into a silence the most solemn I ever remembered to have witnessed, for all my faculties were low, and unusually brought into deep silence. I said to myself: ' What can all this mean? And I saw them dividing in great heat . The division began in the churches on points of doctrine. It commenced in the Presbyterian Society, and went through the various religious denominations, and in its progress and close, its effects were the same. Those who dissented went off with high heads and taunting language, and those who kept to their original sentiments appeared exercised and sorrowful. And when the dividing spirit entered the Society of Friends, it raged in as high degree as in any I had noticed or before discovered; and, as before, those who separated went off with lofty looks, and taunting, censuring language. Those who kept their ancient principles retired by themselves. It next appeared in the Lodges of the Free Masons; it broke out in appearance like a volcano, inasmuch as it set the country in an uproar for a time. Then it entered polities throughout the United States, and did not stop until it produced a civil war. An abundance of blood was shed in the course of the combat; the Southern States lost their power, and slavery was annihilated from their borders. This vision is yet for many days. I had no idea of writing it for many years, until it became such a burden, that, for my own relief, I have written it. 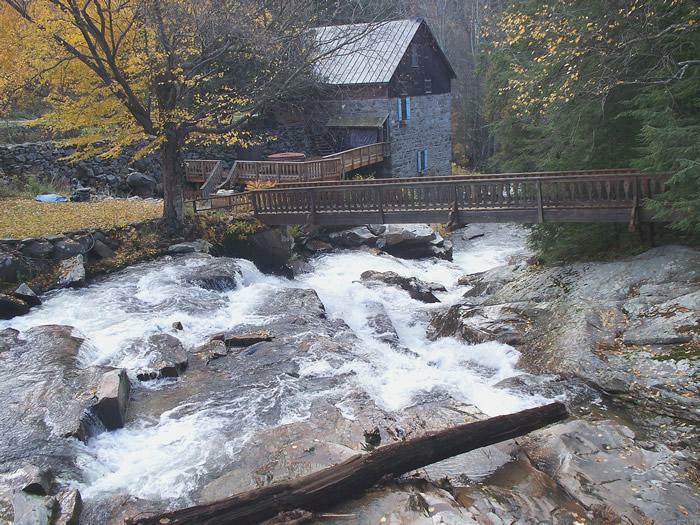 The Hoag Gristmill was long associated with a prominent family who were among the early settlers of Starksboro. Land records show that the site of the mill was purchased in 1788 by Joseph Hoag of Nine Partners, New York, from Benedict Alford of Ferrisburg, Vermont. Although Hoag's renown in Quaker history was to come from his later vision while plowing his Vermont farm and from his relentless travels for the Society of Friends as far away as Illinois and North Carolina, he was known even in the late 18th century as a tireless rider whose circuit among Friends Meetings brought him often into Vermont. In 1789, Joseph Hoag transferred the mill site to his father Elijah. The following year Joseph's name appears in the first U.S. Census as residing in the town of Monkton, from which 2726 acres, including the millsite, were annexed to Starksboro in 1797. In 1793 Elijah Hoag sold-the property to two of his other sons,, Elihu and David, and to his son-in-law, Stephen Carpenter, At the time of the 1793 sale of land, there is no mention of any gristmill. By 1799, however, when Carpenter sold his portion of the land to his partners, he specifically excluded his rights in "the stone mill on the falls" and his mill privileges on Lewis Creek.The mill remained in the Hoag family until 1831, by which time a sawmill had been built next to the gristmill. In 1896, the gristmill was exempted from taxes, indicating this year as the time of the fire which destroyed the wooden interior of the mill as well as its attic story.